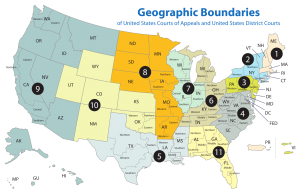 This colorful map showing which states fall into which federal judicial circuits is just plain a handy thing to have around. I am sure that, properly matted and framed, it will also make a fine gift this upcoming Father’s Day! Pinning this up near the phone just could make Pop sound pretty smart one of these days. Just. Say. Ing. Wow, how nice, and practical too. Perhaps we could have it made into a very attractive cloisonnÃ© key fob.